PHOTO SUBMITTED This undated photo shows the neon lights as they looked at the Tiffin drive-in movie theater. A neon artist formerly of Tiffin is working toward a historical restoration of the original neon at the Tiffin drive-in movie theater, Field of Dreams Drive-In. Michael Flechtner is from Tiffin and has a neon studio based in California. After being in contact with Donna Callahan-Saunders, owner of the drive-in, Flecthner decided to work on restoring the original neon by building all new neon and mounting hardware on the outside of the tower and on the interior of the tower, new neon transformers and new primary and secondary wiring. Flechtner said he remembers the neon from when he was young, which inspired him to become a neon artist. In 2011, Callahan-Saunders said they invested in new electrical, plumbing and added a movie screen. New digital projectors were added in 2013. 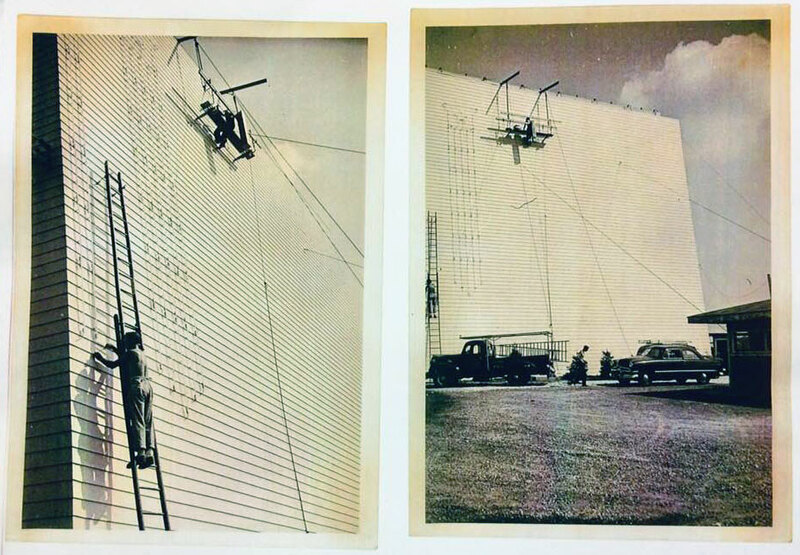 PHOTO SUBMITTED These undated photos show the neon lights being installed on the front of the Tiffin drive-in movie theater. “Each year we continue to improve the property and services offered with a goal of enabling the new generation of customers to make similar memories as those who attended in the 1950s and ’60s,” she said. Callahan-Saunders said when they acquired the drive-in they took on a significant restoration project. 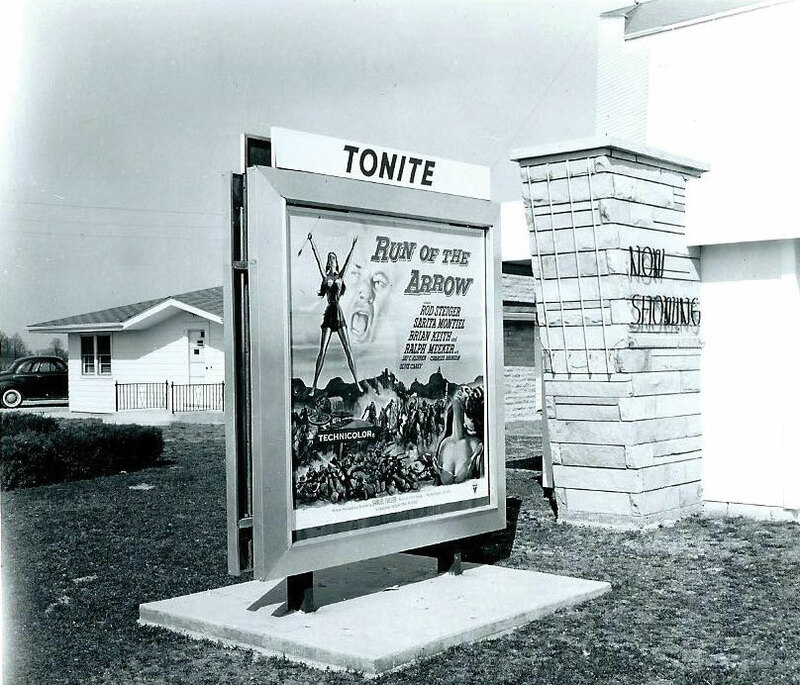 Callahan-Saunders said the original neon was removed before they purchased the drive-in due to high cost, because the neon tubes would break in severe weather. “Part of the work to restore the neon is to work with local experts who can help design a way to protect the neon tubing from severe elements,” she said. The project includes Flechtner making 200 neon tubes in red, white and blue, which he said will take about to two-weeks to complete. Flechtner said he and Field of Dreams ownership plan to meet with representatives of the American Sign Museum in Cincinnati about the historical importance of the restoration. Flechtner plans on working on the project in Tiffin at a fellow artists’ studio, which he plans on starting in the spring. To move toward the restoration project, Flechtner is seeking photos of the former drive-in neon from anyone who has them. Flechtner has gone through the Seneca County Museum archives and still is seeking photos. In addition, donations can be made to the project and questions can be directed to the Field of Dreams Drive-In at (877) 343-5334.